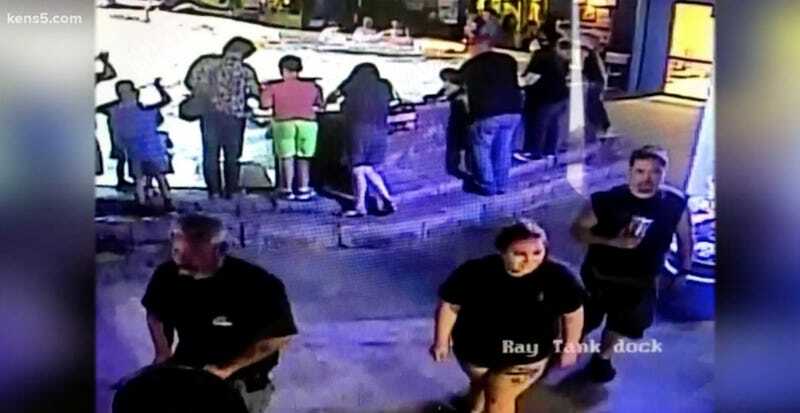 If you saw a baby being pushed in a stroller near the San Antonio aquarium on Saturday afternoon, guess what, it might have been a shark. According to Leon Valley police chief Joseph Salvaggio, three enterprising shark thieves made off with a three-foot long horn shark around 2:15 p.m. on Saturday after grabbing it out of a touch tank and plopping it into a stroller. Horn sharks are about three feet long and they look like this. As you can clearly see, the shark is not in the tank. Aquarium staff somehow didn’t notice that the shark was missing for about 45 minutes, and the cops initially thought the 911 call was some sort of joke, since Shark Week just wrapped up. They are looking for two men and one woman, and there is surveillance footage of the three suspects. After an employee unsuccessfully tried to follow them as they escaped, their getaway car was eventually found. However, authorities do not expect the shark to survive.